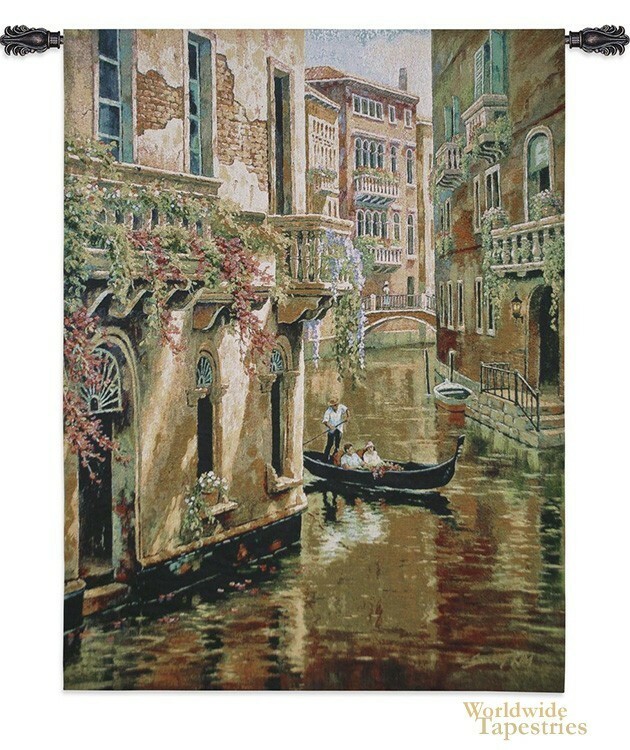 A scene of a Venetian gondola on the waterways in the afternoon is shown here in this tapestry "Afternoon Chat" by contemporary artist Kim. The waterside houses are seen here laden with flowers from their balconies as the gondola meanders through this section of town. Each home is accessed by the water and the rustic and traditional appearances of the buildings can be seen here, creating a view of life in Venice, a most unique location where water meets the city across 117 small islands, established since the 10th century. This city is the place of countless poets, explorers, painters and composers and its romantic and history filled city and waterways is a ripe place for enjoyment of this wonderfully unique city. This tapestry "Afternoon Chat" is backed with a lining and has a tunnel for easy hanging. Note: tapestry rod and tassels, where pictured, are purchased separately.